For private tuition, NARM/early trauma therapy sessions, please enquire via email. For details for supervision / mentoring and consultancy services, please click here. If you would like me to come to your organisation and offer a workshop / training, please contact me. "Nourishment and Depletion - The Nervous System"
An annual residential training. This year, module 1 & 2 are put together as a week long residential at Kilnhanger, in beautiful Surrey Hills, England, UK. A 50 hours intensive training designed for yoga teachers/teacher trainees, holistic therapists, psychotherapists, or keen movement practitioners. It is an enquiry, a vigorous investigation into our innate ability to balance "nourishment & depletion" to understand what supports healing and maintenance of the body-mind and move toward optimal health. And at the same time, fully accepting and welcoming all aspects of ourselves as they are in the current states as a starting point. It is done mainly through experiential study of the Nervous System and Embryology/Infant Developmental Movments, along with other body systems and helpful practices. We then look at application to yoga and other therapeutic modalities and to our daily lives. The aim of this training is to provide practitioners / teachers with tools and understanding in a way that they will be able ot create / integrate into their own unique body of work. Previously called Restorative Yoga and Yoga Therapy from Somatic Perspective. This is an incredibly informative and rewarding training. **Commuting option is also available for those who live near the venue or for those who stay at another accommodation near by. For this option, the cost (excluding the tuition fee) will be £345 for the week, including all the meals and the use of the facility. **Also Camping option is available limited up to 2 persons. The cost for this is £455 for the week, including all meals and the use of the facility. For Booking: A non-refundable deposit of 250 pounds will secure your place. A small group of 12-16 people maximum. Come for a long weekend of relaxing a nd enlivening yoga retreat at the stunningly beautiful Kilnhanger in the Surrey Hills. From early 2019, there will be a series of workshops and classes. "Opening the Window of Resilience"
- Repatterning, reconnecting, rebalancing through movement + body awareness. Through breath and movement exploration, discussion and sharing, this daylong workshop will enquire into the relationships between the health of the mind and the body from the perspectives of the brain, nervous system and developmental movements. Learning about the primal functions of the brain and the nervous system, and how our individual history contributes to our unique tendencies, we can then apply this understanding to our experiences and awareness of movement. By taking time to slow down so we can recognise and sense into the fine texture of sensation and motion to help reconnect us to our intuition and inner knowing, we become more able to re-pattern, repair and re-balance ourselves in life’s on-going process of self learning and realisation. "Exploring Hypermobility from Developmental Perspective"
Find out how our early development can influence our mobility / body tone and its physical and psychological effects. We will investigate this fascinating subject through some movement exploration practice, some partner / hands on work, early developmental movement study, including basic embryology, developmental relational models, primitive reflexes, and the nature of the nervous system. Who is this for? : The workshop is suitable for all movement specialists and practitioners, including teachers of Pilates, Yoga, Feldenkrais, Alexander technique etc, dancers, exercise instructors, medical professionals, psychotherapists and physical therapists or For those who are just keen to explore this subject. Still spaces available. Special discount offer £100 off the full cost!! Book now! A 50 hours intensive training designed for yoga teachers, teacher trainees, holistic therapists, psychotherapists, or keen movement practitioners. It is an enquiry, a vigorous investigation into our innate ability to balance "nourishment & depletion" to understand what supports healing and maintainance of the body-mind and move toward optimal health. And at the same time, fully accepting and welcoming all aspects of ourselves as they are in the current states as a starting point. It is an enquiry and investigation into our innate ability to balance “depletion & nourishment” and enquire what supports healing of the body-mind and move toward optimal health. It is done mainly through experiential study of the Nervous System and Embryology/Infant Developmental Movements, along with other body systems and helpful practices. We then look at application to yoga practice in general inc. restorative yoga and other therapeutic modalities and to our daily lives. This one week residential trainings (50 hours) is held at a beautiful venue in Surrey, called Kilnhanger, near Guildford. Kilnhanger. It is located in the wonderful Surrey Hills with an amazing panoramic view from the studio, clean and comfortable accommodation, serving delicious healthy food and over all, an incredibly nurturing environment for this exploration and learning. This is a professional training, however, if you are have keen interest in participating, there is a chance that you will be accepted on this training. If you are such an individual, please enquire. Understanding the origin gives us a deeper insight into the nature of the NS and into how we ‘regulate/balance’ and what that means. This is a hugely informative and enriching study. The course will also include exploring cells, other body systems, (including Organ System, Immune System, Fluid System) for understanding the wider context of health. We will explore ‘embodied relational presence’ which is fundamental to any therapeutic relationship or in fact any relationship at present. Also explore different types of touch that support clients/students’ own healing process, including a conscious choice of ‘not-touching’. Investigate different types of body tissues and their tones which can inform us of the state the person is in. We will go beyond ‘body reading’ and look at ‘tissue reading’. These aspects of ourselves hugely contribute to our health and we will look into what that might be. This wonderful practice really teaches us to witness oneself and another and speak about it in a way that helps both the person moving or the person witnessing. Essential skill for supporting oneself or another/others which I find often undeveloped in practitioners and teachers. Also a great tool for a profound processing of emotions and other psychological and physical matters. Also to support professionals to cultivate the practice that is sustainable and rewarding. Remainder is due 2 weeks before the training commences. Please see the below and choose your accommodation. The tuition fee is included in the costs below. Please state your first and second choice at the point of booking. The first come, the first served. It is going to be a cozy, small group training, around 12 people max. The cost includes the tuition fee, all the meals and the use of the facilities and teas / coffees. This is a beautiful open plan bedroom with en suite shower room situated above the yoga studio. Single roomA small but stylish room with a beautiful view. Use of shared bathrooms. A small but comfortable and stylish room with a beautiful view. Use of shared bathrooms. A good size bedroom for 2 people with big windows and a beautiful view. Aki is a real explorer of all movements and living body-mind. As a yoga teacher, having practiced many styles and approaches of yoga over 30 years, she now mainly teaches a slow vinyasa flow style, integrating somatic perspective of movements. She encourages her students to be actively involved in enquiries so that they will find their own unique path that is honest and truthful to themselves. Aki’s classes are known for their explorative nature and are fun and light yet profound. She is a Body-Mind Centering® practitioner (by the time of the June training, she will be a certified BMC® teacher) and an Integrative Bodywork and Movement Therapist, and is a registered somatic movement therapist / educator, and a qualified NARM therapist working with developmental / relational trauma with adult clients. She teaches Somatic Movement workshops on embodied anatomy, developmental movement, embryology. Teaches a restorative yoga teachers immersion training, and runs regular retreats, as well as own training programs for yoga teachers and therapists, such as this one. Jane has been practicing in the field of somatic therapy since 1995. She is a Registered Somatic Movement Therapist with ISMETA, a Registered Biodynamic Craniosacral Therapist and Registered Somatic Experiencing Practitioner. Her work with somatic movement includes, Continuum and Discipline of Authentic Movement. Jane teaches on the Integrative Bodywork and Movement Therapy Diploma training in Russia and Lithuania. She is currently participating in the Circles of Four programme for the Discipline of Authentic Movement, with Janet Adler as her mentor. Her focus of research has been on the connection between breath, somatic patterns and fluid body dynamics and how movement supports our access to resiliency and connection. This is a groundbreaking training for those wishing for a deeper exploration of the body-mind connection within the overall theme of nourishment. I highly recommend this training course - I found it to be fascinating and greatly beneficial to own practice, my teaching and life more broadly. Dear Aki, I'd like to thank you from the bottom of my heart for an incredibly genuine, educational, experiential training full of so much love, support and friendship.…. I feel you have opened a door for me on a missing link. With all the work I've done previously, I've never been introduced to the nervous system, and I feel this is such an important piece of the jigsaw to continue to work with the remnants of my ME….. 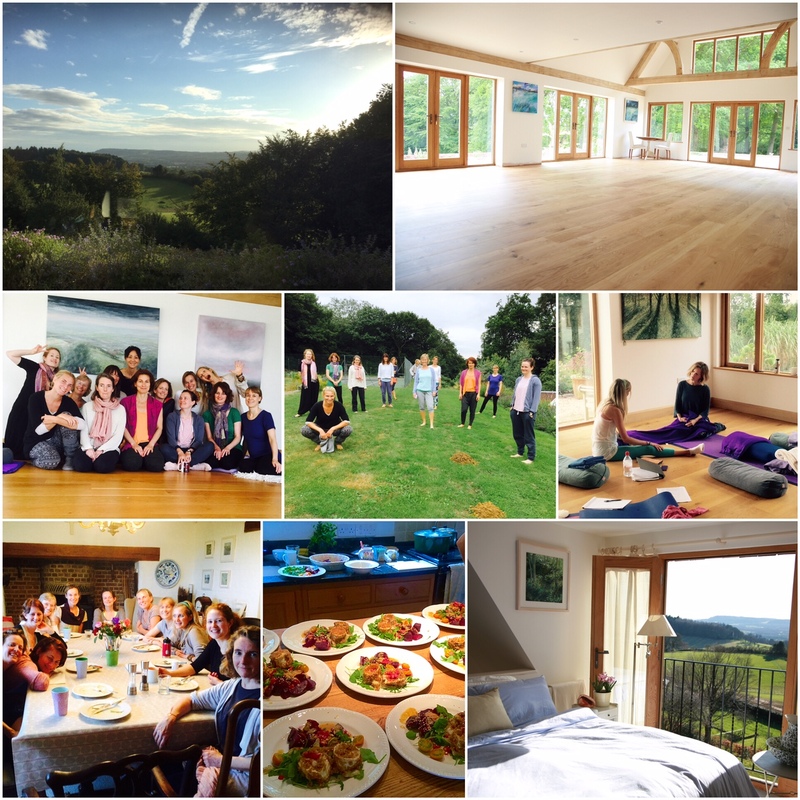 Thank you so much for such an incredible teacher training…. I feel that I have learnt so many skills that can deepen and support my yoga practice and help my friends, clients, family and myself with on a day to day basis. I really feel I have a deeper understanding of myself and others because of your training. I am more grounded, more present, more available to others, more at ease in my everyday movements and feel completely inspired to continue learning… I can't put into words how much it means to me to have done this training. Thank you Aki for your incredible teaching, I always feel so lucky that I learn so much, consciously and unconsciously from you. I feel like you always bring me back onto the right track…. Yes, I went there to grow as a yoga teacher. But I advanced as a human being - which means my yoga has changed. I changed as a practitioner and as a teacher as well. Whatever happened, thank you Aki and thank you girls! I felt at home, safe and supported in this group from the first moment. And felt at home in this house, in the area. Aki’s in-depth knowledge and generous spirit make her teaching a unique experience. Little gems of insight and understanding continuously arise during her sessions, which profoundly shifts awareness and perception so there comes about a real felt knowing in the body and new confidence in moving. Big thank you Aki. I have been giving much supervision to teacher training students and other yoga teachers for sometime. Also offering advice to teacher training faculties over the past years that I have decided to make it a little more formal in this area of service that I offer. This is a mentoring and Supervision and Consultancy offered for yoga teachers, teacher trainees, somatic practitioners and for those who wish to include somatic perspective on their trainings, workshops and teaching. Aki is available for individual & group mentoring/supervision, consultancy in person and Skype supervision and consultancy. *In case of hiring a space, then the cost of the hire will be added to the fee, unless something else is discussed and arranged.